Fee : USD200- , Three lessons (80 minutes/per), with ensemble scores. 2) The participant will receive the part score of Leo Brouwer：《Cuban Landscape with Rain》、《Cuban Landscape with Rumba》、《The Sky, the Air, and aSmile》, through email by July 15. Please practice well in advance. 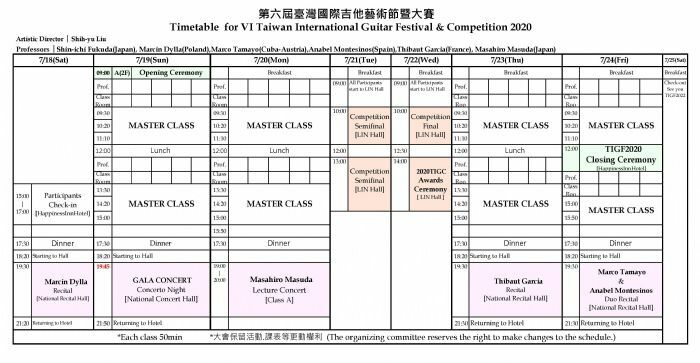 4) Those who performs well in class will be selected as members of"ASIAN GUITAR ORCHESTRA", will perform in a concert, conducted by Leo Brouwer on the evening of September 14. Performers must wear black clothes, socks and shoes to perform at the concert. Please bring and setting your own score, music stand and foot stand for performance. 1) Registration starts from now until June 15. The number of places is limited and will be based on the completion of the payment and registration procedures. 2) Only course enrolled can purchase three concerts’ tickets with aspecial price of USD26- each (priced at USD33-), each concert limited to one. 4) All participants are requested to go to Happiness Inn Hotel [No.9, Ln. 322, Siyuan Rd.,Xinzhuang Dist.,New Taipei City Tel : 886-2-2997-6688] for classes. 5) Recommended Accommodation：Participants are requested to make a discount on your own accommodation @ Happiness Inn Hotel. Note 1：You may apply for an 80% refund before July 15, 2019. After this date, no refunds will be given. The fees are not transfer able between persons, events or years. NO EXCEPTIONS will be made tothis policy. By registering for this event you agree to these refund terms. Note 2：The organizing committee reserves the right to make changes to the class schedule.